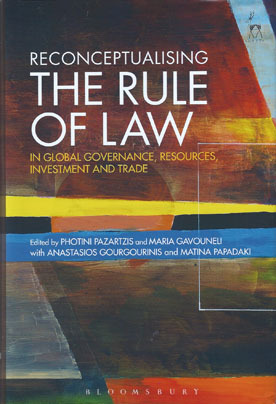 Based on selected conference papers presented in the 2013 ILA Regional Conference, hosted by the Hellenic Branch of the ILA, we are glad to annnounce the publication of the book Reconceptualising the Rule of Law in Global Governance, Resources, Investment and Trade by Hart Publishing. Abstract and preorder available here. “A Landscape of the Contemporary Theory of International Law”. The 12th ESIL Annual Conference will be held in Riga on Thursday 8 - Saturday 10 September 2016. ESIL Interest Group events will be organised, as usual, on the day before the conference, on Wednesday 7 September. The conference is hosted by the Riga Graduate School of Law in cooperation with the Latvian Constitutional Court. The next Arghyrios Fatouros Prize will be awarded in 2015. The most important work in the ILA is carried out through Committees of diverse membership established to undertake research and prepare reports on selected areas of international law. Nominations for membership to ILA Committees are made by the Branch and passed to the relevant Committee Chair and the Director of Studies for their approval before being considered by the ILA Executive Council. The Hellenic Branch encourages its members to actively participate in the work of the ILA Committees. The Hellenic Branch was one of the oldest branches of the International Law Association (ILA), first established in 1911. It took its present form in 1998, when it was incorporated as an association under Greek law. Today, it brings together international lawyers, academic and practitioners alike. In the spirit of the objectives of the International Law Association, the Hellenic Branch is strongly committed to the study and development of public and private international law. To this effect its members play an important role in the work of the ILA committees and study groups, contributing to the advancement of international law and the creation of closer ties between international lawyers. Download the .pdf below to read the full statutes. The Hellenic Branch operates under a Board of Directors.